It's me, again, Robin Redd. It seems like it's been a LONG time since I've been here. It feels great, all the same. Have you jumped on the planner band wagon, yet? Oh, boy, I sure did! Technique Junkie stamps into my planner. I came up with this dashboard. 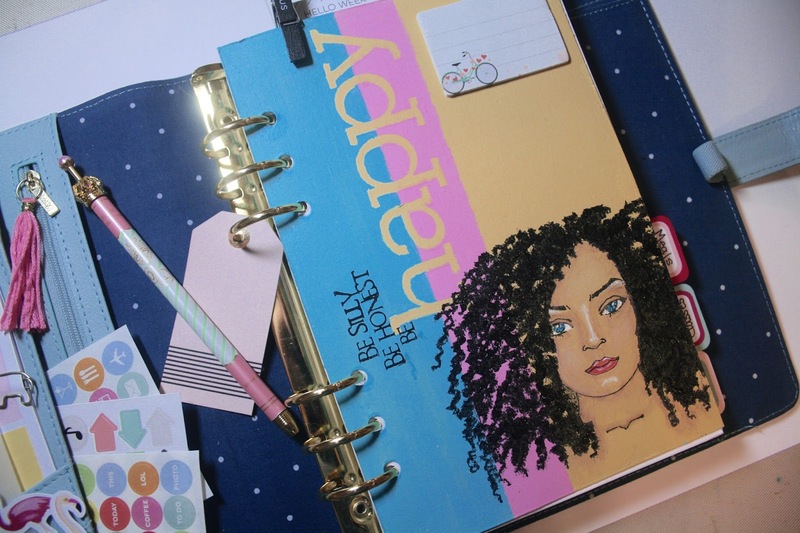 Yeah, there's a whole new lingo to go with the planner craze. I used one of my favorite stamps, #P006 Let's Face It 1, for my focal point. After I stamped her, I painted her hair with Art Anthology's Black Leather Jacket Sorbet to give it some texture and dimension. I love how it turned out. I colored in her face with Prisma Colored Pencils. I also used Art Anthology's Cayman Sorbet for her eyes and Mi Bella Sorbet for her lips. I used an old stamping trick, Pick and Omit, with #SDX001 Be Silly. With a black Pitt Brush Pen, I inked up just the words I wanted, leaving out the word "kind". Then, I stamped it so it would read, "Be Silly, Be Honest, Be Happy." please visit my blog, Redd Robin Studios.